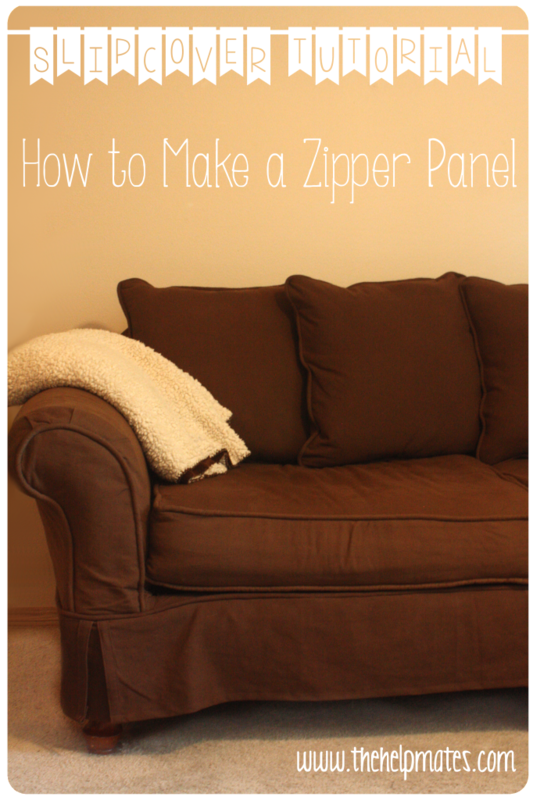 This is part 2 of my couch slipcover tutorial. Go here for part 1. Make sure you measure your cushion before going to the store to buy a zipper. You’ll want the zipper to hang over about 5 inches on each side of the cushion to make the cushion cover easy to get on and off. I bought a zipper that was about 5 inches short and had to get creative about making it work (you can check out the next part of the tutorial to see what I did). If you can’t find a zipper long enough, you can buy a zipper roll and cut it the right length. Cut one strip of fabric that is the length of the zipper plus one inch and the height of the cushion plus about two inches for your seam allowance (mine was 8 inches wide). Cut the strip in half lengthwise. Pin the zipper even with the edge of one of the strips, zipper side down. Using the zipper foot, sew down the fabric as close to the zipper as possible. You’ll need to unzip the zipper a little since it’s bulky and gets in the way. Once you get a little ways down the zipper, you can zip it back up past where the needle is. Pin the other side of the zipper even with the edge of the second strip of fabric (zipper side down again), and sew in the same way. Iron the second seam open, and you’re done! Look for part 3 of the tutorial next Friday!